Why feel tied to the bench when it comes to the need of troubleshooting electronic circuits in the system? 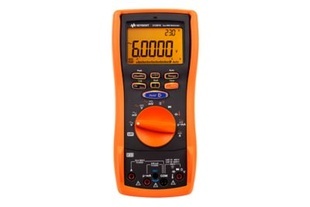 Gain the confidence to achieve trustworthy measurements with the 60,000 display resolution and 0.025% basic DCV accuracy. The U1280 series handheld digital multimeter (DMMs) lets you carry out test and measurements over a longer duration than ever before with up to 800 hours of battery life. Even when operating in harsh conditions, the U1280 series is strong enough to stand up to the task with certification of Ingress Protection Marking (IP) to IP 67 level of dust and water protection. 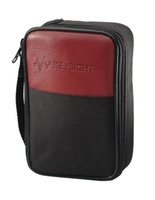 When it comes to the need to observe measurement over a period of time, Keysight Meter Logger software provides a comprehensive data logging experience with the U1280 Series as well as other Keysight U1200 Series handheld DMMs. The U1280 series can be easily connected to the Meter Logger software that runs on a PC via Infrared (IR)-to-USB cable, or to do so wirelessly with the optional Keysight Remote Link solution. Keysight Meter Logger software provides users the flexibility and useful configuration to view their logged data in trend plot or table format. Once the measurements are recorded in the software, users can easily transfer the logged data into various types of report formats with just a click of the button. Download the FREE Keysight Meter Logger software to work with any Keysight U1200 Series handheld DMMs. You can add Bluetooth connectivity to any Keysight handheld DMMs and clamp meters from the U1200 series. Just attach the U1117A Bluetooth adapter to the IR port of your Keysight handheld meter and download the complimentary Keysight Mobile Meter and Keysight Mobile Logger applications to your iOS or Android smart device. You’ll get to view measurements on your iOS or Android smart device wirelessly and remotely via Bluetooth technology. It's that easy! If you are using the U1115A remote logging display, the U1117A IR-to-Bluetooth adapter allows you to safely measure, view and log test measurements with an extended range of up to 100 meters. The Keysight Mobile Meter allows iOS or Android based smart devices to connect and control up to three handheld meters and view measurements from each connected handheld meter simultaneously. The Keysight Mobile Logger lets you log data and it will provide trending graphs from as many as three handheld digital meters.